From SlowTV, to Sigur Ros’ album launch and iHop’s live “commercial”, addictively slow-paced TV, streaming and cinema have been central to the movement. But what is “slow cinema” and how can it counteract the poisons of a frantic, skip-intro world? Slow cinema isn’t a specific genre and which films fit the description are up for debate. Few films are made purposefully with the label in mind and some filmmakers even resent the stamp. However, most critics agree it adheres to a few simple principles: utilising long shots, minimal camera movements, undramatic narrative (circumventing the typical shapes of stories) and a skew toward realism. With its ability to transcend Newtonian physics, cinema is usually the antithesis of boredom. It exists to entertain. But while studios blow billions on creating outlandish galaxies, a niche group of filmmakers have been observing the beauty in the seemingly mundane. Refreshingly, this isn’t about escaping the real world, it’s about forsaking cheap tactics to rather study and celebrate it. “Slow cinema” only became common in 2003, but slowness in cinema isn’t a new concept. Ozu, Bresson, Ackerman, Kiarostami and Angelopoulos have all sculptured with time, compelling the audience to contemplate and reflect. Because, unlike other forms of cinema, slow cinema requires the viewer to be an active participant. The audience must be conscious of passing time in order to feel present. Perhaps this is why there’s been a resurgence in reducing the pace of films – a counter-reaction to the mindless rat race. Michelangelo Frammartino’s film is a meditation on the cycles of life and reincarnation. Shot in a rural town in southern Italy, the film has no dialogue, relying rather on the stationary long shots of pastoral beauty to speak for themselves. The title is inspired by Pythagoras who claimed to have lived four lives: mineral, vegetable, animal and human. Forsaking traditional narrative, the film captures the daily routines of an elderly goatherd, then a baby goat, then a majestic fir tree and finally a humble kiln where the tree is turned into charcoal. Through these stages, humanity recedes into the background which Frammartino hopes will give the audience “a pleasant surprise: the animal, vegetable and mineral realms are granted as much dignity as the human one”. It’s a film designed to make us think about how we fit into the world around us. Modernity has made us lose touch with the cycle of nature and Frammartino presents us with a larger picture, not our insignificant 9-to-5. It reminds us that we’re not the centre of the universe and should be aware of and live in harmony with the elements. 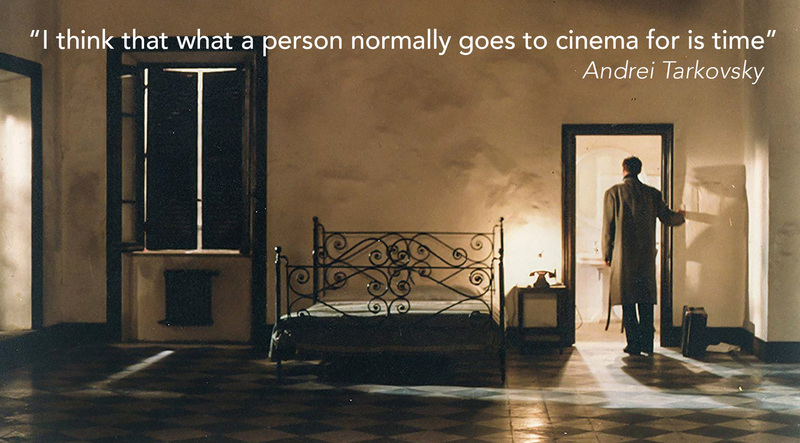 Roy Andersson rose to fame with the acclaimed film A Swedish Love Story. When his next film Giliap was a flop, he took a hiatus from filmmaking and directed over 400 commercials. During this period he perfected his style of long diorama-style shots with dark, deadpan humour. He returned 25 years later with the self-funded Living Trilogy. A Pigeon Sat on a Branch (2014) is the third installment and possibly the most accomplished. Comprising 39 vignettes, each set has been so painstakingly built and the characters so meticulously placed that it feels like you’re viewing one Edward Hopper after another. Lingering in these spaces as the scenes play out allows your eyes the time to examine each corner of frame and admire the attention to detail. As Andersson has admitted: “…paintings are the only inspiration for my aesthetics.” These are tableaus bursting with modern life with all its hopes and blunders and should be studied like we would do in art galleries. The Sacrifice is about an aging professor celebrating his birthday with family and friends when a nuclear crisis is reported on TV. In desperation, he strikes a bargain with God sacrificing all that he loves if the apocalypse is prevented. Tarkovsky described this, his final film, as a “meditation on the absence in our culture of room for spiritual experience.” It was released just months before he died of cancer which no doubt influenced his melancholic view of a civilization. He knew this would be his final statement and, dedicating it to his son, perhaps left it as a warning to live a life of purpose. There’s no benefit to coasting through life and allowing society to become spiritually degraded if, in the end, everything is destroyed by our poor decisions. No last minute rash decision nor desperate search for meaning will be your salvation. Slowness was always present in Tarkovsky’s work but The Sacrifice is especially known for its ambitious and complex opening and closing sequences (running to nine and a half minutes and six minutes fifty seconds, respectively). The overall mood of the film is shaped by the challenging tempo of the editing which allows room for its creator’s wisdom and sincerity to be reflected upon and, hopefully, for its warning to be heeded. This Studio Ghibli animation forsakes dialogue completely but the sounds of nature and the sparse but elegant score tell a tale all to their own. The Red Turtle follows a man caught in a violent storm that spits him out onto a small tropical island with nothing but crabs, seals and turtles to keep him company. He encounters the chaos of nature and tries to escape by building a raft and setting out to sea but he’s repeatedly impeded by a large, persistent red turtle that wrecks the vessel. Through time he accepts his fate, embraces chaos as part of life and falls in love with nature. Quite literally, actually: he builds a home and a family on the island with the shapeshifting turtle that transforms into a woman. In a short run time of just 80 minutes, this modest tale manages to cover the story of life through captivatingly simplistic and painterly visuals. It’s a zen-like parable for ecological awareness that can only be absorbed in quietude. Whether you’re interested in slow cinema or not comes down to what you want from a film. Quick-cut movies offer an escape from the modern world, but slow and deliberate films, and art, may just be able to change it.